In a febrile property market, calm heads must prevail: that’s the message from our property guru client Jonathan Crown. He’s taking a long-term view to the market and firmly believes that bricks and mortar remain our best investment. Insight into this sort of tactical thinking is key now we find ourselves as a creative consultancy in a strange, new ‘design for Brexit Britain’ world. But why should you re-brand in such an atmosphere – and how? Jonathan’s property search, purchase, sales and management business has proved a great case study. We’ve just completed a complete ground-up ‘creative business review’ for Jonathan, looking at the entire branding of his business. He felt strongly that the company needed to remain current and felt his previous look was causing more problems than it was solving. With this in mind, and keen to adopt a completely fresh approach, Jonathan commissioned a new brand design for the company. Overall this had to be a simple graphic look that was immediately distinctive, and we were happy to oblige. Interestingly, during the design process we tried a series of different colours for the type and Jonathan kept pushing us, keen to see more options. He was unsure what he was after until… that lime green version was requested. And the problem was solved. On paper it sounds a little strange for a premium property company, but the end result certainly looks very striking. It really works, particularly against a charcoal background. So we embraced Jonathan’s choice, and it has come to be a centrepiece of the of the website that followed the initial design process. With new branding elements in place, we turned to the main event, Jonathan’s new website design. We always begin projects of this kind with a ‘customer-first’ approach. In this case there were quite a few different kinds of customer, so the design is deliberately flexible, allowing for changing emphasis over time. 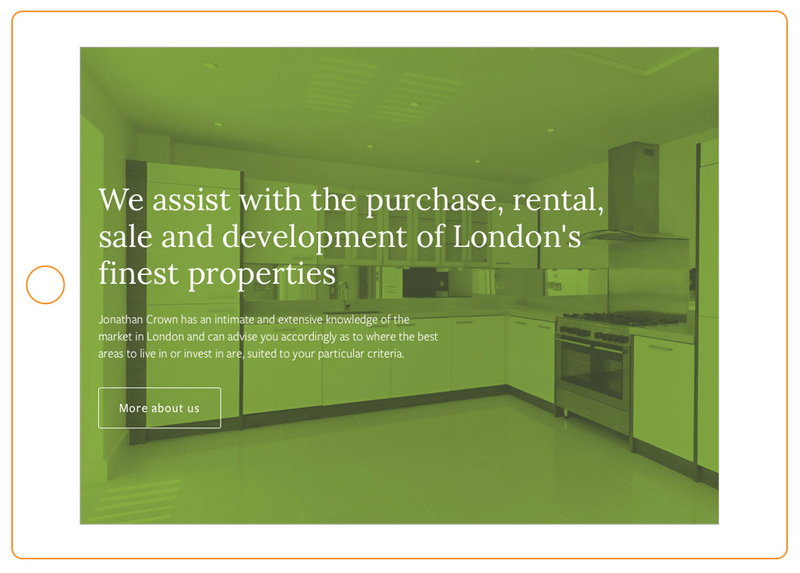 Key to the success of this site is gorgeous bold photography, and Jonathan did us proud, providing a wide range of interior shots as well as vistas of London which interchange on different pages. 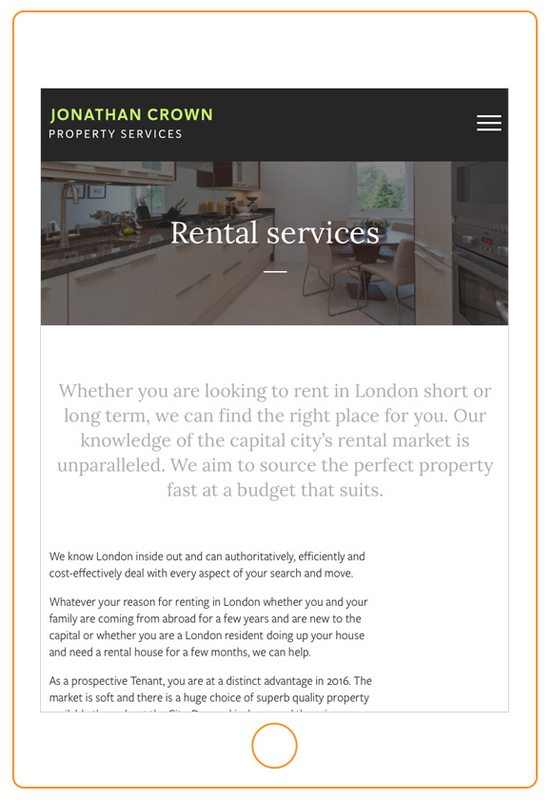 The site is completely responsive, working on all devices from smartphones to wide-screen office screens. 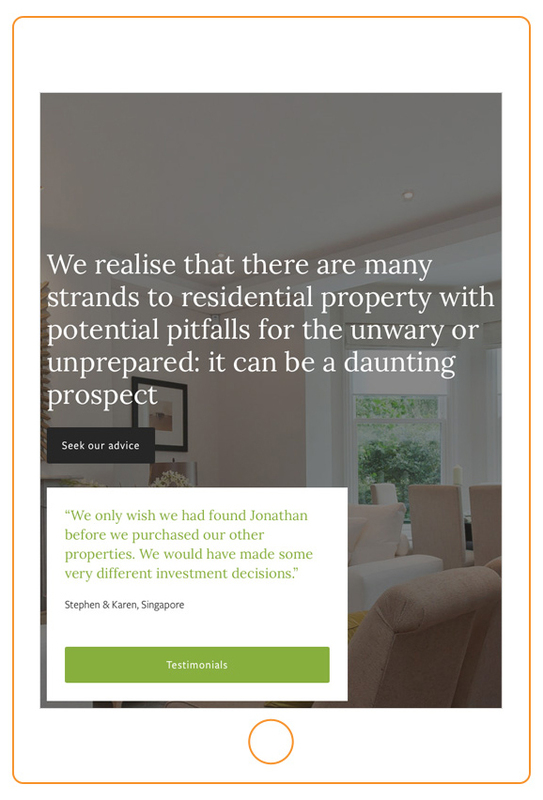 We devised this alongside a completely bespoke, considered website design aimed specifically at Jonathan’s client base. DESIGN FOR BREXIT BRITAIN: WHERE NEXT? 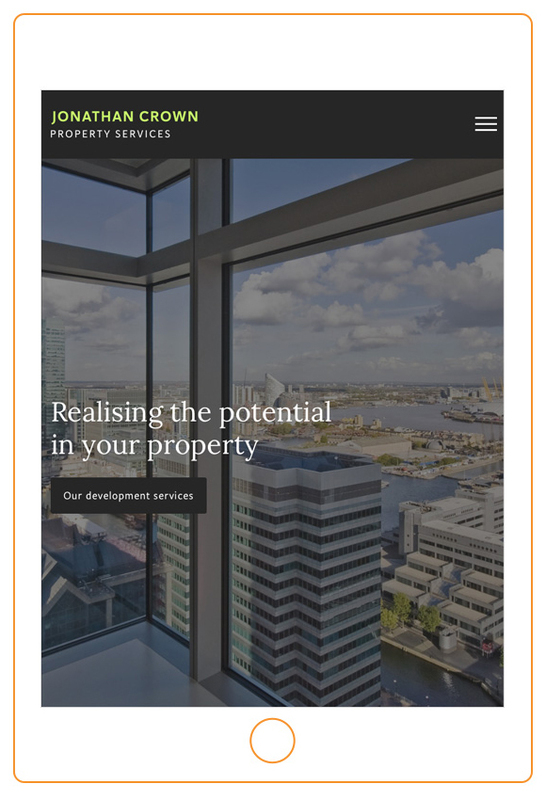 The UK property market seems to be one sector that is particularly vulnerable to the somewhat unpredictable economic situation that the UK now finds itself. As such it’s a good idea to keep a close eye on players making a success of this new landscape. We believe that Jonathan Crown’s investment in marketing his business with fresh, bold design is extremely prescient. His offering – a combination of wisdom, decisiveness and years of expertise in good times and bad – combined with a creative, striking new design brief sets him apart. Our experience is that in difficult economic environments, many businesses draw in their horns precisely at the moment when they could be standing out and taking advantage of new opportunities. That’s going to be at the core of our offering to companies approaching us in the coming year – making calm, considered design and marketing choices that are the most likely to be effectively translated into sales.